"The Lever Brothers Company was established in Cambridge by William Lever. The firm was an American subsidiary of an English company of the same name. The Lever Brothers parent company had been manufacturing soap in England since the 1870s. Its most prominent brands included Sunlight soap, Lifebuoy soap, and Lux soap flakes. By the 1880s, the company had experienced significant success from its product line and began expanding production to meet international demands. The firm did not attempt to make an entrance into the U.S. market until the 1890s. 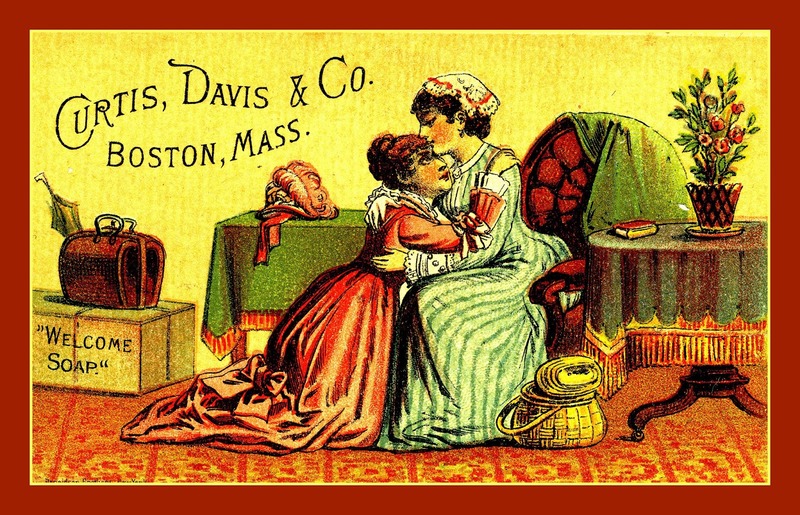 Initially, in 1895, Lever established only a small office in New York to handle American sales; however, by 1898, the firm had purchased a Cambridge-based soap manufacturer – the Curtis Davis Company, which was established in 1835 and known for its Welcome brand of soap – to begin production stateside (Gale Group, 1998; Cambridge Chronicle, 1902).During its initial years in Cambridge, the Lever Brothers company saw only slow and steady growth. Despite the success of the company’s Sunlight and Lifebuoy brands overseas, the firm was unable to replicate these sales in the United States. As a result, the company’s primary product early on was the Welcome soap brand inherited from the Curtis Davis Company. In 1913, however, with the appointment of Francis A. Countway as company president, the firm began to see significant expansion in U.S. sales." In various parts of the Earl J. Arnold Advertising Card Collection, you will find information on the color printing process that made trade cards appealing, color lithography. There is another aspect of the trade card phenomenon that deserves our attention, however: artistic design. This is harder to track down, since artistic credit is almost never printed on the trade cards themselves. I was delighted to find that someone has been researching this. Kevin MacDonnell (MacDonnell Rare Books) has written an excellent article in the New Antiquarian (the blog of The Antiquarian Booksellers' Association of America), "Charlotte Perkins Gilman’s Trade Card Designs." "The Bride Saying Farewell to Her Mother"
"slender man shakes hands with rotund gentleman"
"old man admires laughing baby in arms of maid"
"Cupid delivers pair of Valentines to pair of young ladies"
One of the best discussions of Gilman's work appeared in "The New Antiquarian" blog. Kevin MacDonnell's article Charlotte Perkins Gilman's Trade Card Designs is highly recommended.